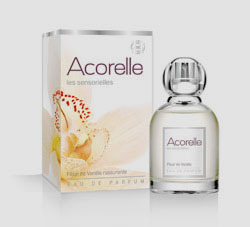 This eau de parfum unleashes the power of Peru balsam and vanilla, highlighted by notes of patchouli and almond. Vanilla Blossom will instill a feeling of comfort and safety. Fine French Fragrance—made with organic alcohol and 100% natural fragrance materials. No synthetic fragrance. No phthalates. Ingredients: Organic Alcohol 80% vol., water, fragrance.